Hall Photography 101: Forgot Anything? As I am writing this, I’m preparing to go to a convention myself, so I’ll be checking to make sure that this article is as accurate as possible. Keep in mind that this works for me personally and you might have other things to pack in. Get them. Got them? Good. Ok, now that everyone else is taken care of, it’s time for what photographers need to bring. You need your camera, but you better make sure to bring your charger, any extra batteries, and memory chips that are not full already. No ammo and you’ll have a very bad weekend. Check to make sure that they are in good working order, clean and turns on/off properly, and holds enough charge for hours of shooting at a convention. Now for those of you who own DSLRs, you’ve probably got extra lens, flashes, batteries, filters, reflectors, etc. Be careful about how much you bring. Too much and you’ll be weight down. Too little and you might not get the kind of shots that you want. For just hall photos, stick to having one flash (preferably one that is either diffused or tunable, and lens that isn’t for bird watching (say, up to 85mm), reflector. For nighttime shooting or indoor shooting, you might want a light stand for your flash and/or a tripod. Again, be sure to pack those batteries and memory chips. Ok, now that you packed all that, you think you’re done right? Well, you’re wrong. Sure you got all the basic things you absolutely need, but you’re forgetting things that you need to stay healthy: food, water and water. Now you’re thinking “I’ll just go to Mc Donald’s” or some other place that’s close by. There are lots of problems with that. 1) Money: Some food places close to conventions are expensive restaurants. 2) Health: Fat American jokes/insults aside, as a photographer, you won’t be at 100% by eating only fast food. And don’t even think about Cup Ramen, too much salt, not enough of everything else. 3) Portability: You can eat where you are, no walking. Having food in your pack helps if you’re shooting from dawn to dusk (or from 9 to 12 or 1 AM in the morning like I do). Sandwiches and salads along with some jerky and trail mix. You heard this in health class, but honestly, a good, balanced meal helps keep you on your feet and avoid Con-Flu. Ok, we got food, but what about fluids. Now people swear by energy drinks like Red Bull or Monster, but I personally avoid them. If they work for you, fine, but for hydration, it’s a very bad idea. Also, I know conventions at or near hotels means drinking parties and that’s fun, but don’t you dare drink alcohol all day long. No one likes a drunk in the morning and good luck shooting straight. Stick with the tried and true method. Some juice and soda is fine, and alcohol at night with friends is ok, but if you want to stay on your feet, either buy water bottles or bring a canteen. Forgot anything? I think there’s a kitchen sink. *Money, Clothes, Meds, Toiletries, and ID. 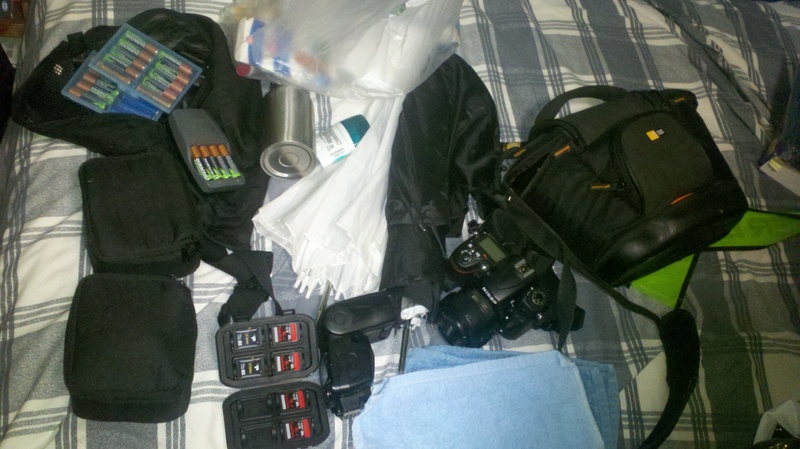 *Basic load: Camera, lens, batteries, charger(s), memory chips. *DSLR heavy: Lenses you’ll need for close and portrait, flash(es), reflector, flash diffusers. Light stands and/or tripods. *Portable foods and water bottles. Well, there is one final thing you can do to prepare: Research. You should check out pictures from previous conventions that others took or even just pictures of the hotel. They always highlight certain areas so you know where are good places to meet new cosplayers or possible places for photoshoots. You might find a garden, a couch, or even areas you wouldn’t think like loading docks and staircases. If you can get there a day early to explore, I highly recommend it, even if you’re been to that same location for years. Hope this helps, future photographers, see ya next time. ~ by BlizzardTerrak on November 8, 2012.